This is a commission from December last year. I never had time to post it with all the Christmas madness and actually forgot all about this! I was browsing through photos from my old camera when I stumbled across it and it occurred to me that I hadn't shared it with you. 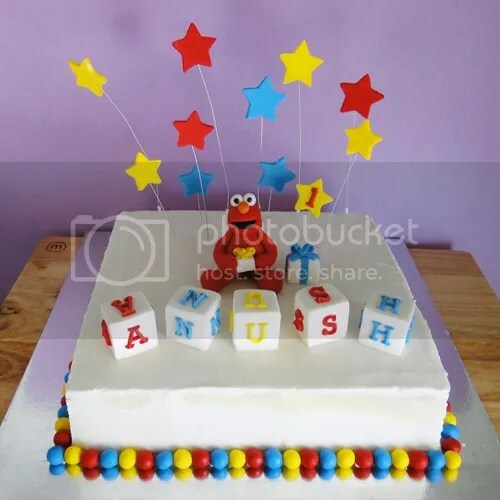 This birthday cake was for a little boy called Anush who was celebrating his very first birthday. 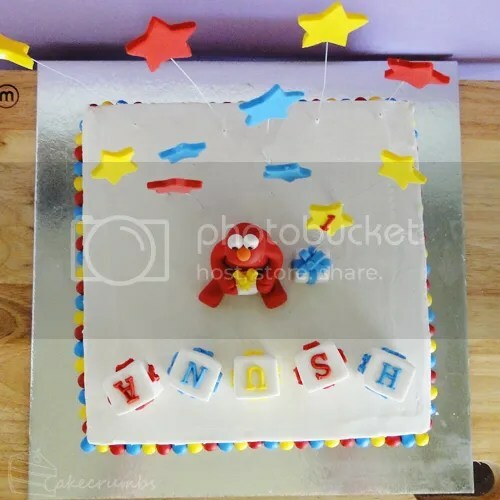 Sitting atop the cake, gift in hand, is everyone's favourite monster: Elmo. I had originally intended to make him fluffy, but all my usual techniques for texturing fondant came out looking horribly. It didn't look like fur and kept ruining the shape of the fondant figure. So in the end I decided to keep him smooth. 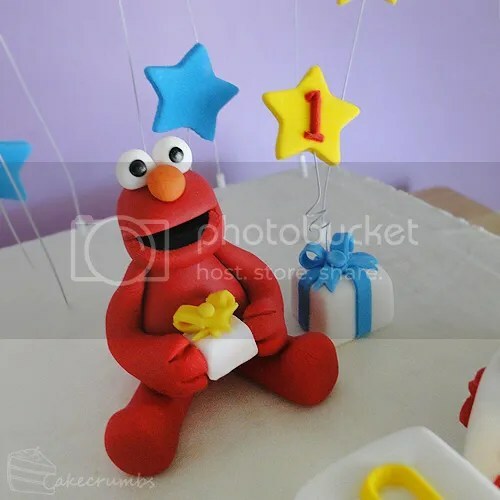 All of the decorations are fondant, but the covering of the cake is royal icing. Leading up to the day this cake was required we had a gorgeous week of low 20°C weather. But the day before it was required was 31° and the next day was due to be pushing 40°. I don't have air con in my house and it heats up really quickly, so I wanted to avoid as much fondant work as possible. I spent the day freaking out and making every effort to keep the kitchen as cool as possible, trying to avoid the fondant becoming limp and sweating and melting. Thankfully it all turned out okay, but I was definitely nervous for a while there! The cake inside is butterscotch. This wasn't a flavour of cake I had baked before, or even heard of really. We're familiar with butterscotch pudding, but none of us had come across it as a cake before. 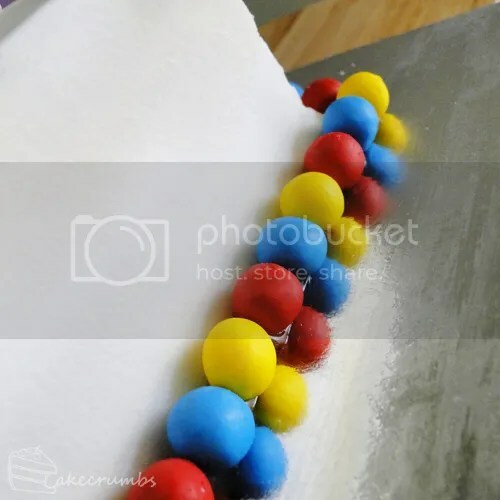 After browsing a few recipes I got the gist of the general flavour profile and created a recipe for a cake large enough to feed the 40 people who were going to be at the party. The cake baked perfectly flat on top so I didn't even have a dome I could trim to taste test. But the smell of the freshly cooked cake filling my house meant I had to swat some sneaky hands from stealing a bit. I made promises to revisit it again one day. Promises that are yet to be fulfilled. 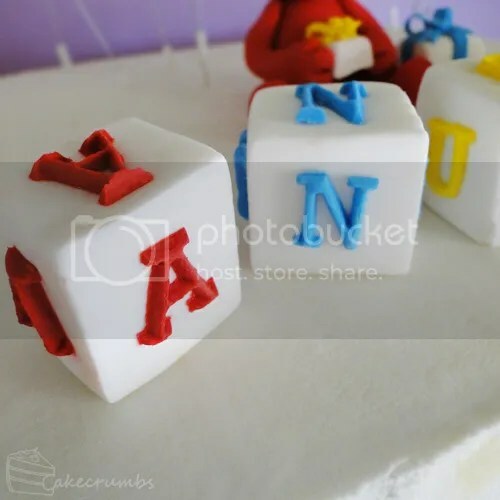 A lovely bright, cute cake. Was great to hear that the family liked it too. It’s always such a relief when I hear the recipient say they liked it haha.